Some of our clients who already own an old outboard motor, and others who contemplate buying a used one, ask us how to measure the length of an outboard motor’s propeller shaft, in order to know for sure that the motor indeed complies with the 20″ long (L) standard that Wavewalk requires. This is an important question, because Wavewalk kayaks and boats work well only with outboard motors that comply with the 20″ long (L) standard set by outboard motor manufacturers, and our company strongly recommends not to use short shaft (S) standard motors. For this matter, the propeller shaft length is measured from the inner top side of the motor’s mounting bracket to the horizontal anti-ventilation plate that’s above the propeller. Note that sometimes the anti-ventilation plate is called anti cavitation plate, although this is an incorrect term. In many cases, this distance between the inner side of the motor’s mounting bracket and its anti ventilation plate can be slightly bigger than 20 inches, and if this is the case, it’s a good thing. If the distance you measured is under 20″, it inevitably means that the motor does not comply with the 20″ (L) standard. In fact, most outboard propeller shafts are slightly longer than their stated standard. For example, the length of a 2.3 HP Honda L is 22.5″, and the length of this motor’s short (S) version is 16.5″. Similarly, the length of a short-shaft (S) 4 HP, 5HP and 6 HP Tohatsu is 17.1″. But don’t fool yourself – 16″, 17″ and 18″ is not 20″, and it’s still a short-shaft (S) outboard, and it won’t serve your purpose. 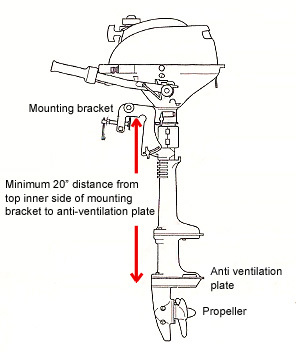 The reason the outboard’s propeller shaft’s length is so important is that it determines both the propeller’s immersion below the surface, which is critical to its proper functioning, and the distance between the propeller’s highest point and the boat’s lowest point, which is critical for trouble-free and effective operation of the boat. Please avoid using short shaft (S) outboard motors with your Wavewalk 500, Wavewalk 700, and Wavewalk Series 4.